How to prepare Italian Garlic Pasta at home? Anything that comes with garlicky flavor works great to me. 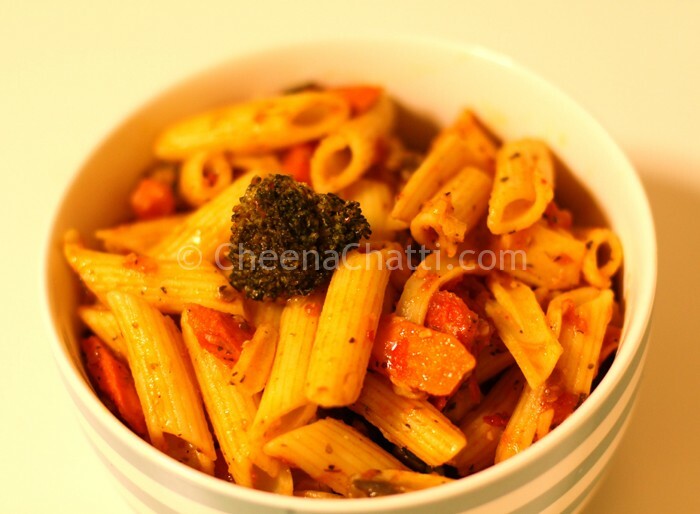 Here is a very famous, easy and authentic Italian dish – “Garlic Pasta” for all those who love garlic and pasta separately, but haven’t tried them in a combo. Cook pasta in salted boiling water for around 10 mins till they are 85-90% done. Drain excess water, rinse with tap water and apply 2 tsp olive oil over it. Keep it aside. Boil water with a pinch of salt and add broccoli and carrots in it. Parboil it for 4-5 minutes. Transfer it to a big bowl and add salt, olive oil, oregano and paprika along with sliced mushrooms. Mix well. Arrange veggies on baking tray. Oven-roast it for around 15-20 mins on 200 degrees. Heat 2 tsp olive oil in a pan and add minced garlic in it. Saute it for a min. Add tomato puree and ketchup into it. Mix dried herbs, red chilly sauce and cook it for 2 mins. Sauce is ready! Add cooked pasta and veggies in the same pan. Add extra salt if required and toss it gently. This entry was added on June 17th, 2013 by SJ in Vegan and tagged with pasta, italian garlic pasta recipe, spicy garlic pasta recipe, creamy garlic pasta sauce, foreign, garlic oil olive pasta recipe, ingredients pasta recipe, garlic pasta sauce, italian pasta oil. Last revised on April 4th, 2018.